1. Cook onions and mushrooms in butter for 4 minutes on high. Drain. 2. Mix together with all the ingredients. 3. Place the mixture in a prepared dish. 4. Cover with wax paper and cook for 6 minutes on high. Spoon the sauce over the loaf and cook uncovered for 7 minutes on high. I served it with Brussels sprouts and yellow rice. The most common method of preparing Brussels sprouts for cooking begins with cutting the buds off the stalk. Any surplus stem is cut away, and any loose surface leaves are peeled and discarded. Once cut and cleaned, the buds are typically cooked by boiling, steaming, stir frying or roasting; however, boiling results in significant loss of anticancer compounds. To ensure even cooking throughout, buds of a similar size are usually chosen. Some cooks will make a single cut or a cross in the center of the stem to aid the penetration of heat. It is exactly for that reason that I make it my way……and my family love it! Cut the Brussels sprouts and half a punnet (or more) mushrooms in quarters. Heat the oil and butter in a frying pan over medium-high heat and lightly stir fry the onions and mushrooms. Add the Brussels Sprouts. Season with salt and pepper. Cook Brussels sprouts 3 to 5 minutes to begin to soften. Add roughly chopped almonds just before its served. Reading other blogs inspires me to try out new and exciting ideas! 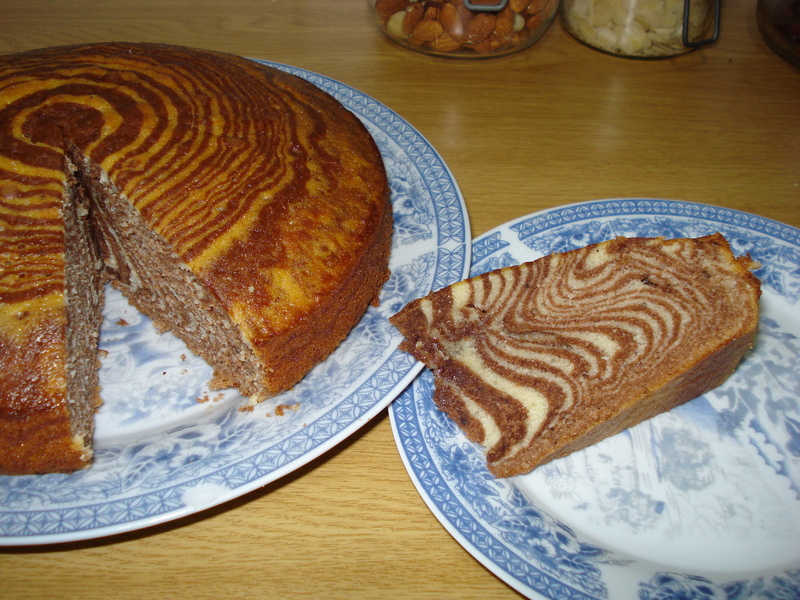 When I read about a Zebra cake it made me think of our many game parks here in South Africa! This is a straight forward, easy batter to make… until it gets to the point of pouring the batter into the baking pan. One needs patience during the batter layering process! – Slightly spray 23 cm round by 4 cm deep non-stick cake pan (or spring form pan) with non-stick spray and line with parchment paper cut to size. – In a bowl, sift together flour, baking powder, salt, and set aside. – In a large bowl, combine eggs, sugar, and beat (with electric beater) on high until foamy, light creamy color (2 minutes). Add oil, butter, milk, vanilla, and continue beating until well combined. – Turn the beater speed to low and as it is beating, sprinkle flour mixture tablespoon at a time, and blend well. It should make about 7 liquid cups of flowing-consistency batter. – To split the batter into two, pour half of the batter (about 3.5 liquid cups) into a different bowl. In the beater’s bowl (with half of the batter), add cocoa powder and beat until well dissolved/mixed. – Place the prepared baking pan on flat surface. – Place one regular tablespoon for the white and another for the dark batters. – Scrape bottom of the spoon on bowl’s edge each time, to avoid dripping. Periodically, stir each batter with its own spoon for consistency. – Starting with the white batter, pour 2 Tbsp (up to 3 Tbsp, no more) of each batter alternatively into exact center of baking pan. The key is not stopping and keep-on going, pouring alternatively, the same amount of batter on top of each other, only in the center. Batter will spread on its own, gradually filling the pan, with multi-rings. For the very last two pourings (most probably the cocoa/dark batter/bull’s eye at the end), only pour 1 Tbsp each. When completed, batter in the baking pan should look like a fine-lined dartboard. – Note: While alternately pouring, if the bull’s eye (last dark batter poured) is shifting from the center, gently/slightly lift edge of the baking pan and adjust the bull’s eye back to the center of the baking pan and then continue the process. No other movements of the baking pan to be made. – With 2 Tbsp each pouring, there will be about 14~15 rings/stripes of each color. – Place baking pan in oven and bake for 50~60 minutes or until poked wooden skewer in the center comes out clean. – Cool the cake in its pan. When cooled, if needed, slide plastic knife along the sides of the baking pan to loosen the cake. Invert cake onto a plate, pull off the parchment lining, and invert onto the serving platter. An easy lunch or dinner for those days that you just don’t know what to eat! Serve it with sliced avocado or a tossed salad. Mix 50 ml mayonnaise 5ml tomato sauce and 5ml mustard. Spread the mixture on bread rolls, Sprinkle with grated cheese and paprika. You can also put the same mixture into a red, yellow or green pepper. Grate some cheese over it and sprinkle with paprika. Bake in 180 degree C oven until cheese is melted. Mushroom soup! One of my market finds inspired me to make this soup for tonight’s dinner. I have also used a bit of truffle infused olive oil to give it an even richer taste. This recipe was given to me in 1981! It is absolutely delicious! Chop about 3/4 of the mushrooms add to the onion and fry until soft. Add the stock slowly and bring to the boil. Season and simmer for about 15 min. Remove from heat and blitz it till smooth.